Michael A. Colasanto, D.D.S. Maryam M. Monfared, D.D.S. Dr. Colasanto was born in Alexandria and grew up knowing that dentistry was his calling. His father was a general dentist, and Dr. Colasanto spent many years working in the office as a teen. He was inspired by his father’s dedication and close relationship with his patients, attributes that are implemented in his practice to this day. Dr. Colasanto regularly attends local and national seminars and conferences which provide a broad range of information on the newest techniques and materials, allowing him to stay up to date on the latest advances in periodontal and implant treatments. 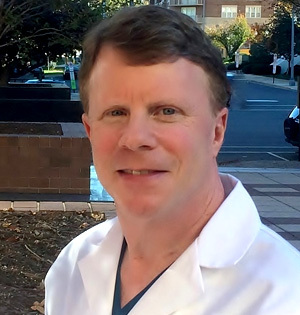 In addition to furthering his own education, he was also member of Virginia Commonwealth University Department of Periodontics part-time faculty and enjoyed giving back by teaching new generations of practitioners. Dr. Colasanto met his wife and partner Dr. Maryam Monfared during his postdoctoral residency at Medical College of Virginia. They have two active sons who keep them very busy with school and extracurricular activities. Some of Dr. Colasanto’s hobbies include cooking for large family gatherings, traveling to local and distant destinations, reading, and working on artistic projects with his kids. Dr. Colasanto feels very fortunate to be so connected to the community. He enjoys volunteering at his son’s school and extracurricular activities such as Boy Scouts and Crew, and regularly participates in local park cleanups. Drs. Colasanto & Monfared, P.C.